Back by popular demand. Students will create the beautiful easy-to-sew "H" Bag (16x13x8") from the Orange Dot Quilts Pattern. Please include your telephone number when signing up for this class. There are two classes being offered: 10:30am-2pm OR 5:00pm-8:30pm. Come and make this cute 11 x 15-1/2 wall hanging while learning the basics of needle turn applique. This is a two session class. Class one will focus on preparing the background and class two will focus on the basics of needle turn applique. This class runs from 10:30am - 4pm. Minimum of two students. Grab a charm pack and some border fabic and whip up this quick little quilt. Everyone will use their best table manners in a dining room graced with this elegant quilt. This quilt is found on page 66 in Country Threads Goes to Charm School book. This class is on Saturday April 27 from 10:30am - 3pm. A group has reserved our classroom space for a Private Sit and Sew. 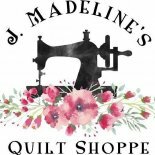 Join the Proud Paper Piecing Peeps of J Madeline's as we make our May baskets! Come on Saturday, May 4th from 10:30-1:30, or Tuesday May 7th from 5-8. This is a technique class. Join us for a fun and friendly time! We will practice making pointed and rounded petal flowers and the classic yo-yo. If time allows, we will also make some leaves using the flower technique. You do NOT need a sewing machine. Come on Saturday May 4th from 11:30pm-1:30pm, or Tuesday May 7th from 6:00pm-8pm. Interlocking chevrons make a fun and unique looking quilt. A difficult looking design is made easy using flying geese, making this a quick and easy quilt to master. This project can be made in eight different sizes: 13x14" / 26x28" / 39x42" / 52x56" / 65x70" / 78x84" / 91x98" / 104x112". Join Deb Thomas on Saturday May 11th from 10:30 am to 4 pm pm to make your own! In this class we will be making a machine appliqued tea towel.